Note: This DIY KL kit does not include E6000 glue (click to purchase) and pliers. Click to purchase the ATHENA Chain Earrings Kit. 1. Measure how long you would like your earrings to be and then use pliers to separate the links. 2. Using the pliers, connect a jump ring to the earring clip/hook. 3. Without closing the jump ring, connect it to one end of the chain link. 4. 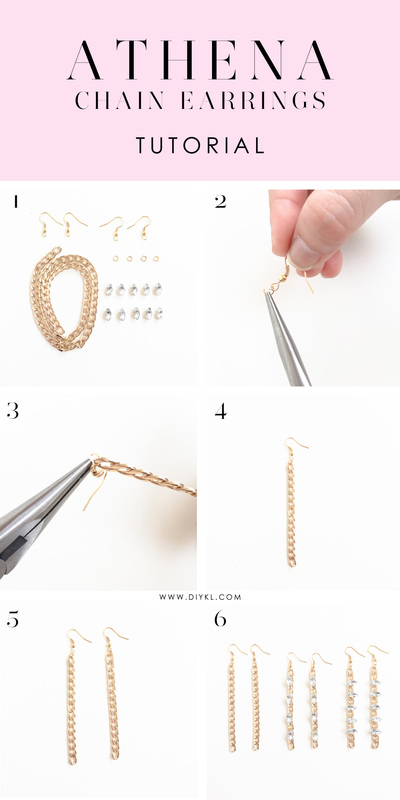 Do the same for the other pair and voila, you are done with your chain earrings! Other variations: Using glue, you can dab the glue on the backing of the rhinestones and either stick it horizontally or vertically onto the chain. Let the rhinestones dry for a few hours before wearing them and enjoy! Look beautiful in your handmade ATHENA chain earrings!